The Pepperdine University theatre department will present the US premiere of the internationally acclaimed play, The Interference, at Smothers Theatre in Malibu from Wednesday to Friday, April 5 to 7, at 7:30 PM, with a special matinee performance on Saturday, April 8, at 2 PM. The cast will host a talkback session after the Wednesday performance. Through the use of a live-mixed soundscape, and set against the backdrop of the worldwide university campus sexual assault epidemic, The Interference follows one survivor's struggle to make her story heard above all the noise. It explores the seemingly infinite source of opinion, commentary, and distorted or suppressed information that have become routine players in the aftermath of these incidents. The play also takes a closer look at the unique circumstances involved when student-athletes are part of the story. 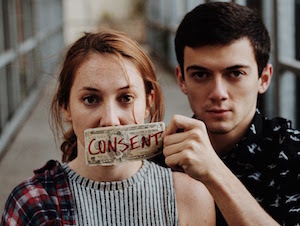 Written by Scotland-based playwright Lynda Radley and directed by Pepperdine professor of theatre Cathy Thomas-Grant, The Interference won the prestigious Scotsman Fringe First award at the 2016 Edinburgh Festival Fringe, the world’s largest arts festival headquartered in Edinburgh, Scotland. The cast, comprised of students part of the Pepperdine Scotland company, spent eight weeks in Edinburgh rehearsing and working alongside Radley and some of the leading members in Scottish theatre. Within days of its world premiere last summer, the show earned acclaim from leading critics at prestigious publications, including The Scotsman, The Herald, British Theatre Guide, The List and Broadway Baby. It has also received a Bobby—an award given by Broadway Baby in recognition of the best of five star shows. It was shortlisted for Amnesty International's Freedom of Expression Award for outstanding work addressing human rights issues. Read more about the award-winning performance on the Pepperdine Magazine website.